I read about it in the newspaper. It was sad. I didn't know he was older then Roger Moore. But it doesn't matter anyway. He had a great careera. He was a great actor. There never be another like him. 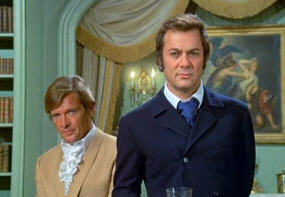 I got the collection of The Persuaders. My daughter manages a Hotel in upstate ny , near Saratoga. In the lobby is a watercolor done by Tony Curtis. A fine artist. RIP.